Will the People confirm the expectations of the establishment and "experts" when they vote on Saturday — or will they confound them, as they have done in Britain and America. Managing editor David Donovan comments. 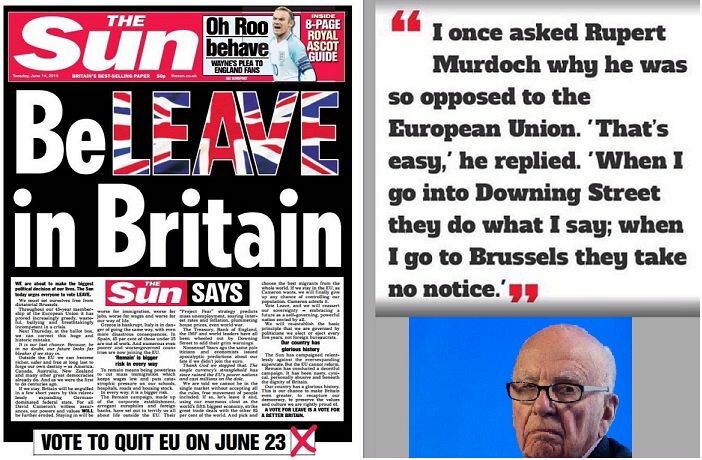 The British – or at least the English − have decided to reject the advice of the prime minister, and the mainstream media (except Murdoch's), and the banks, and the big corporations, and most of the establishment, to vote to leave the European Union. A map of Britain shows that Scotland, most of Northern Ireland and London voted to remain — but the heartland of England voted almost as one to go. The heartland left behind by post-industrialisation, globalisation and austerity. The one fearful of foreigners. And so Britain will leave. And so The Channel and the North Sea again becomes a wall. And Britain will once more turn a suspicious gaze across it — towards the French, and the Germans, and the others. Racists already run riot in Blighty streets. And Europe becomes a darker place. Will it be as dark as it once was, not so long ago? We shall see. The People have spoken in America, where Trump is candidate for the Grand Old Party. Against the advice of the Party aristocracy, the establishment, the old media (but not Murdoch), and the educated elites. He swept the map in almost every state, but was strongest in the American heartland. Where the people have been hurt by the hollowing out of the middle-class, the endless inequality, the relentless march of manufacturing jobs to Mexico and the East, and the fears about immigrants, and terror, and Islam. Trump will build a wall, if elected — or so he says. And America will once again turn its back upon the world. But the People have not yet spoken in Australia. They will speak on Saturday. Then, the establishment, and big business, and the mainstream media – all of them Murdoch’s minions, in one way or another – all say we should vote for Turnbull. The former banker. For stability, they say, Turnbull it must be. Who will cut taxes for multinationals, and foreign investors, and banks, and the rich. Who nobbled the NBN. Who wants to wage a war on welfare. And stop funding public schools. And take money from health and sell off the rest. The People will speak again on Saturday. Will they obey? Or will they again confound the expectations of experts and defy their masters — Murdoch as well? The People will speak on Saturday. And we will see what we shall see. This column was dedicated to the memory of Bob Ellis. You can follow Dave Donovan on Twitter @davrosz. BREAKING: Criminally corrupt media organisation attempts to stir up leadership speculation to undermine Opposition campaign before election. Make your voice heard. Subscribe to IA for just $5.